Being physically active on a regular basis is a goal for many people, regardless of age. 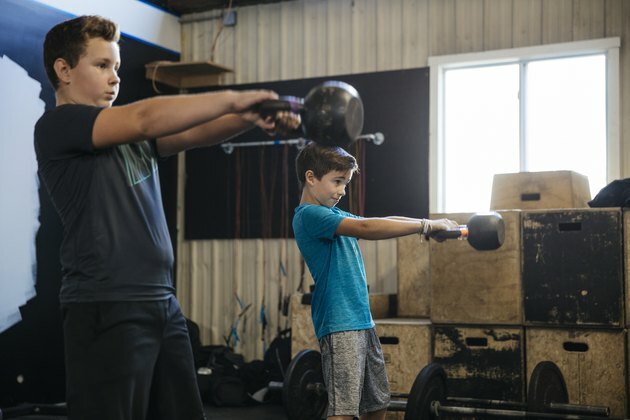 But when it comes to 14-year-olds interested in weight training, it's reasonable to question whether strength training is safe and how to get started. The good news is that most teens can participate in a fitness program that includes resistance training, cardiovascular exercise, and competitive or recreational sports. The first thing to consider when designing a regimen of exercise for a 14-year-old boy or girl is the pace of the workout. The teen years, especially the early ones, are not the time to hit the weights hard and fast. It's important to stress the point that progressing to heavier weights doesn't happen overnight. Taking it slow and building gradually involves spending more time on proper form, which decreases the chance of injury. With that in mind, focusing on the basics and making it fun is at the core of a workout for a 14-year-old who is weightlifting. It's good for beginners to start with body-weight exercises such as pushups, squats and wall sits. More advanced teens can use free weights or machines to train their muscles. When first getting started with exercise for a 14-year-old boy or girl, make sure there's proper supervision at all times. Consider school weightlifting classes or participation in a strength and conditioning program designed by a certified personal trainer or coach. If the teen is an athlete, designing a program for conditioning and sport-specific weight training will be of benefit both in and out of competition. When done correctly, this type of weight training can increase motor skills, strength, power and performance while decreasing the chance of injury. The types of exercises appropriate for 14-year-olds depend on their goals and current fitness levels. According to the Physical Activity Guidelines for Americans issued by the U.S. Department of Health and Human Services, children and adolescents, ages 6 to 17, should do 60 minutes or more of moderate to vigorous physical activity daily. Included in this recommendation are exercises that strengthen the muscles and bones such as weight training. Perform exercises for 12 to 15 repetitions. Perform two to three sets of each exercise. Include exercises that focus on larger and smaller muscle groups such as squats (using light weight to begin), lunges, hamstring curls, bench press, lat pulldown, pullups, shoulder press, arm curls, triceps push-downs and pushups. Perform core-specific work after weight-training sessions. Include exercises such as planks, crunches and glute raises. Schedule at least one day of rest between weightlifting sessions. Include cardiovascular exercise three days a week for 20 to 30 minutes.